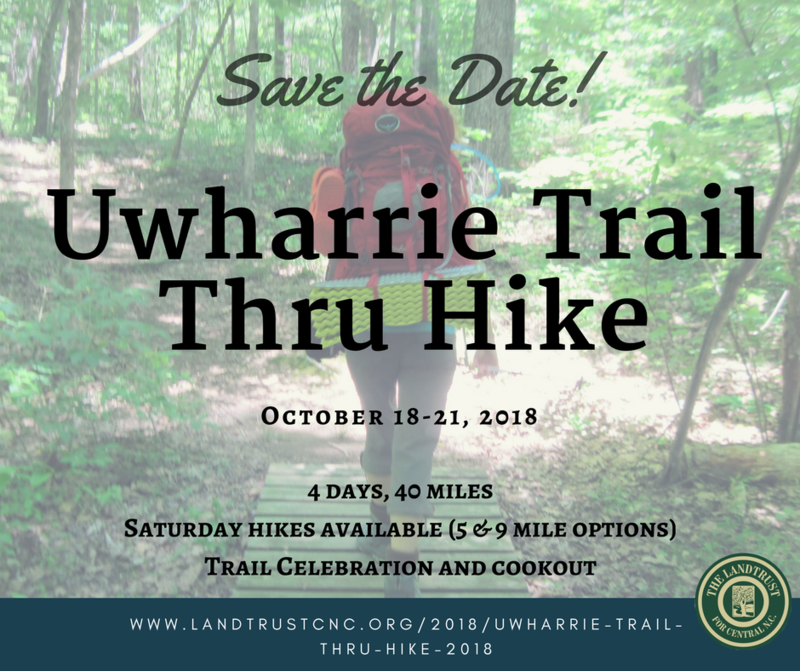 The LandTrust for Central NC in partnership with the Uwharrie Trailblazers would like to officially announce the dates for the 2018 Uwharrie Trail Thru Hike: October 18 – 21! Have you heard of the Uwharrie Trail? At 40 miles, it is the longest single-track footpath in central North Carolina. The LandTrust and other conservation partners have been working for the past 20 years to reconnect this trail, and thanks to these efforts it can now be hiked in its 40-mile entirety. This Uwharrie Trail is known for its cultural and natural significance, including such unique features as old gold mines, rare plants and wildlife, ghost stories, and more. Join us for an awesome backpacking trip through some of the oldest mountains in the world, as we pay tribute to the trailblazers and uncover the secrets of the past. This is a backpacking trip, so everyone will be responsible for bringing and carrying their own gear and food. The thru hike will go from south to north, and we provide transportation to the start (Wood Run Trailhead on Highway 24/27) from the end (Tot Hill /Talbott’s Branch trailhead on Tot Hill Farm Road) on the first day of the hike. Campsites will be near roads, so if you are interested in joining in for only a portion or in slack packing, that is an option but you must arrange for your own transportation. IF YOU REGISTER FOR THE FULL 4-DAY THRU HIKE, YOU MUST HIKE THE FULL 4-DAYS. We are not allowing registration for only a portion of the hike, unless you sign up for the Saturday day hike. If you cannot commit to the full four days, please do not register as you will be taking someone’s spot who can do the whole hike. We recommend a pack weight limit of 40 pounds. YOU CANNOT HIKE WITH US UNLESS YOU ARE REGISTERED – we hike through some sections of trail that are not open to the public at this time, so it is not possible to do this hike on your own. Also, please no dogs on this trip. To minimize user conflicts, we are discouraging hikers from bringing alcoholic beverages on the hike other than what is provided by trail angels. We are also requiring a quiet time of 9pm at night when noise should be kept to a minimum. Most people will be winding down and finding their sleeping bags by that time anyway, so as a courtesy to others we are requesting that you limit noise after that time. There is a required fee of $60 to join the thru hike if you register before May 31st, and it goes up to $70 after May 31st. This includes a cookout the last night and a commemorative tee shirt, and a one-year membership in The LandTrust. We are also in need of trail angels to help out with logistics. You’ll receive a free tee shirt for helping. Any additional donations will go directly towards our work reconnecting the trail and are fully tax deductible. Thanks so much for your interest and support of The LandTrust and the Uwharrie Trail! We are looking forward to and hope you can join us for another great thru hike adventure! You will need to register for the event online at: www.landtrustcnc.org. If you have questions please contact Crystal Cockman at crystal@landtrustcnc.org or by phone at 704-647-0302. THE FULL 4-DAY THRU HIKE IS FULL! EMAIL CRYSTAL@LANDTRUSTCNC.ORG TO BE PLACED ON THE WAITLIST.